Keeping with last month’s tribute to him on the 10th anniversary of his passing, this month’s featured yidaki was made by the late Milkay Munuŋgurr in 2005. Here he is playing it in 2006. He found this yidaki while doing his ranger duties, clearing roads after a cyclone that took a heavy toll on the region in early 2005. Mr. Munuŋgurr couldn’t help but notice the potential yidaki among the fallen trees. I believe he made two from what he found post-cyclone. He originally intended to sell this elsewhere along with a few others, but asked me what I thought about the lot first. A couple were really great, with this at the top of the list. I raved about it but told him his hole patching wouldn’t fly. It’s normal to come across knot holes in the wood while carving down a yidaki. He used epoxy to cover up these holes, leaving visible white lumps on the otherwise natural wood instruments. I said, “c’mon, you’ve got to at least paint over these patches.” I raved about this instrument, anyway, and told him if he could make more like it, I’d buy them all day, any day for top dollar at the Yirrkala art centre. He came back a week later with this instrument painted. He told me that since I liked it so much, it was for me. And I’ll always keep it. This little cyclone-power yidaki got used a lot over the next few years. We used it for the pictures on his instructional CD, Hard Tongue Didgeridoo instead of the actual instrument used on the CD which was made by someone else. If this yidaki existed at the time of recording, I’m sure he would have chosen it instead. 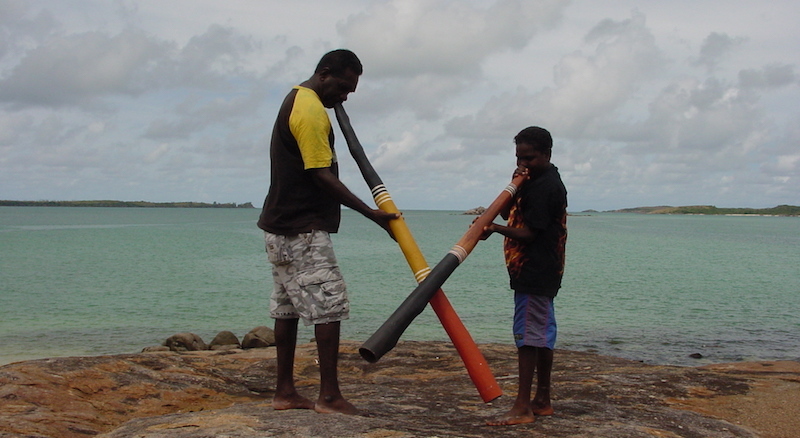 Buyu plays this yiḏaki with his father at Dhanaya – from the Hard Tongue Didgeridoo photo shoot in 2005. We took it to festivals and workshops. I loaned it out for ceremony if I was there to keep an eye on it. I had a collection of 8 yidaki that I showed to different payers and elders to get comments for my master’s project, and this was always the favorite of younger players like the late Mr. Munyarryun in this clip. After he played all the yidaki, I asked him to pick a favorite, tell me why, and show off on it for a bit. Unfortunately, my camera battery ran out just then and I only have a few seconds of that. I’m glad I at least have the above simple clip. Djakapurra and Mirarra also participated in that project and loved this instrument. It was used on the first three Mulkay Manikay Archives CDs that I recorded at Dhalinybuy, Yilpara and Gurrumuru. I brought a couple of options, but the players and singers always settled on this yidaki for the majority of the recording. Here’s a clip from the Gurrumuru session which I’ve posted before. And here is young Arnold Djunbiya Marika playing it at Dhalinbuy with some of the youngest songmen you’ll ever see. Incidentally, I have a sealed set of those first three CDs. If you want them, contact me. You can also buy downloads from all the usual online suspects. Here are links to Amazon: Gurrumuru – Dhalinybuy – Yilpara. Several more were recorded and released after my time there as well. I’ll write another post about that series later on. Most elders said that this yidaki is a potential ceremonial instrument called Dhaḏalal. In this clip, slightly extended from what appears on elsewhere on this site, Djalu’ plays the yidaki, taps it a bit and then says, “Guḻkuḻa,” referring to the birthplace of the Dhaḏalal for his mother’s Gumatj clan. Oddly enough, its maker disagreed. To him and the younger players I showed it to, it’s a perfect “lead yidaki” suitable for any clan song. 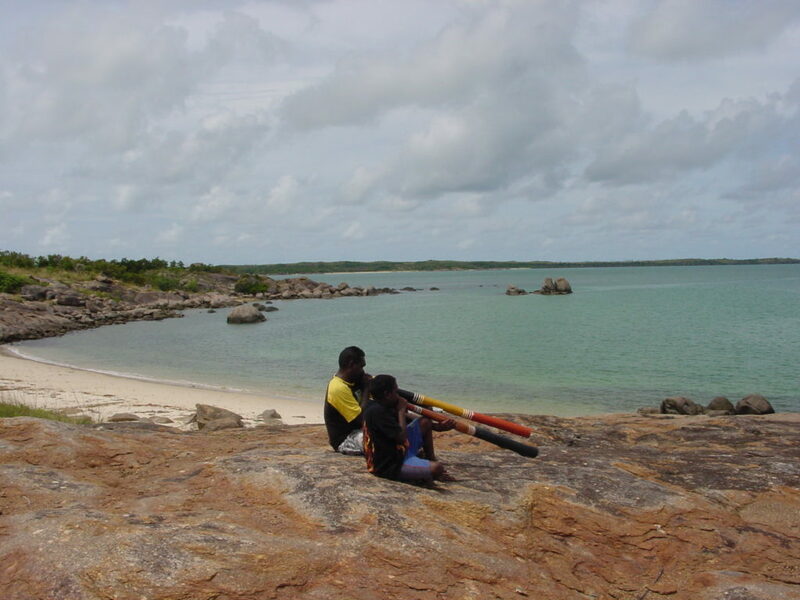 Yolŋu today use rock and roll terms and talk about, lead, rhythm or bass yidaki. Despite older museum examples and what many elders said, Mr. Munuŋgurr, who played Dhaḏalal ceremonially countless times, preferred a deeper yidaki with a fuller trumpet note, like the one he’s pictured with here. He chose that one for the trumpet note exercises on his instructional CD. But that’s for a future Yidaki of the Month episode. Nevertheless, I used this little cyclone-power yidaki semi-formally as a Dhaḏalal, myself. The annual Garma Festival takes place at the origin of the Dhaḏalal at Guḻkuḻa. The Yirrkala art center’s Gapaṉ Gallery traditionally opens at the festival with Mr. Munuŋgurr’s mother and her sisters doing a small bit of that ceremony, performing ritual mourning, or milkarri. Crying songs. Garma 2007 was just a few weeks after his passing. I figured they’d need a yidaki for that gallery opening ceremony. I brought this one out and showed it to his mother and asked if she’d like that one to be used. She cried briefly, hugged me and asked me to play it. So as dark fell that night, I played the ceremonial dups, triggering the beginning of the ritual crying of his mother and her sisters, obviously in a more real and heartfelt way than usual. It then had a little break out of the public eye, then continued to be a popular loaner. Yolŋu men often saw the craftsman’s signature and pointed it out to others. This little yidaki continued to get respect on behalf of its maker who earned it. Another wonderful story. Well done again my friend. This also shows how much a part of Yolnu lfe yidaki really is.